I add myself to that. This one was not only the best of the competition but impressive on its own, too. very well done!!! best 4K intro this year. Perfectly crafted and polished. I might agree, but thumbs up because the visuals have nice colors and good detail. a bit boring, but in 4k...thumbs up! ugly colours, nice music and what pantaloon said. nothing new, and boring too. On the better side of raymarchers, but... it's a raymarcher. seen before.. other scenes though but look and feel definately seen before.. renew yourselfs.. Anyway, much better than what I expected from the crummy screenshots. Bright and higly detailed. Maybe not new on contents, but enjoyable to watch. Once I get over the brown, it gets way better. :) Yes, it's "yet another raymarcher", but it is on the upper scale of things. I like it when raymarching-intros don't just show "semi-random never-ending landscapes" and actually use the technology to try to put on a show. Clearly, some thought and care went into both cameras and rooms in this one -- well done! Looks good but rather boring. Nothing to add to Gloom's comment, so, er, what he said. Boring raymarcher 4k, but piggy for the scene at lower-left on the screenshot. nice, but boring. Also, what pantaloon said. Entertaining and - and that's rare in most raymarch 4ks - well balanced. Not too long, really nice geometry and the music is pretty nice too. Wasn't completely blown away by this, but it's definately well executed and it's obvious that you know your stuff! Great work! quite good, and music is nice too, but this raymarching stuff is getting really boring already. polished and to the point, but only one scene was really interesting. also, tunnel full of little yellow penises! good scenes and pretty cool music with some fresh sounds in it. I'm not impressed anymore by the raymarcher-camera-switch 4K recipe. unlike gloom and break i never got over the ugly brown stuff. still piggy though. Some objects looked like a waffle, and I hoped you add chocolate - but you didn't. A tiny, tiny thumbdown for the palette actually, please never use brown'ish yellow again (that's not orange). 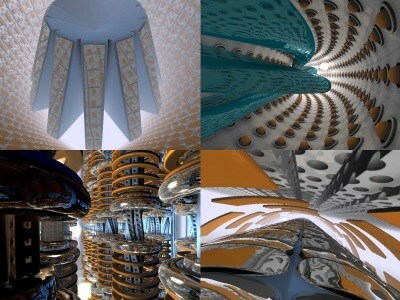 Yes, that shiny raymarching look gets old. But heck, this demo does have a certain kind of soul I can relate to. Perhaps that's because of what Gloom and Punqtured said. My favorite part of this has to be the music - unfortunately, I have a HUGE gripe about the cameras rotating and/or moving too fast to fit the pace of the tune.. Anyways, nice (and unique) scenes, and I agree with what Punqtured said about being balanced. Nice job! Hits an "uncanny valley"-like spot for me, while other raymarching intro like http://pouet.net/prod.php?which=55560 do not. Fairly stereotypical raymarching scenes, but well executed. Thumbs up, that was my favourite 4k at the Evoke! Thumb for the perturbed reflexions. Ok overall. rulez added on the 2012-08-18 18:18:58 by ɧ4ɾɗվ. During the compo I quickly felt I had seen this all before. But as some others rightly put it here - even though it's yet another raymarcher, this one has plenty of creativity and polish. So thumb up. using FRAPS but ATTENTION: FRAPS may not auto-save result when this scene quitted. awww, shame it ends so abruptly, this was so pretty! and it had waffles! Joa. Some nice polished stuff but a bit boring. I say very nice. Reflections are cool. page created in 0.026236 seconds with 15 queries.